Rancho Santana is located within driving distance of two international airports that service most major airlines. There is also a small regional airport 15 minutes from Rancho Santana that can be accessed commercially from Liberia, Costa Rica or by private charter. Rancho Santana can arrange group or private ground transportation for guests arriving or departing from any of the above airports. For those staying in an ocean-view home a 4×4 vehicle is required. We do recommend vehicles for all guests as it offers the most freedom and flexibility to get around the property. Dollar Car Rental offers rental cars at competitive rates on-site at Rancho Santana, and can arrange for pick-up at a Dollar Car Rental at any of their Nicaragua locations. All guest vehicles are required to be 4×4. 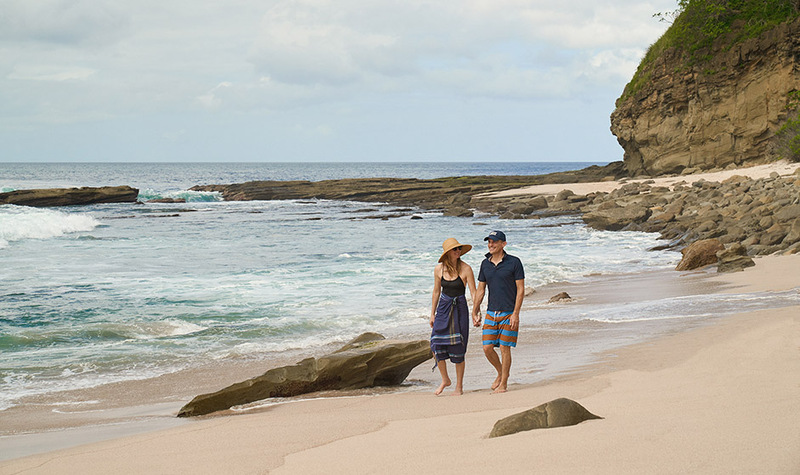 Rancho Santana also offers a complimentary beach shuttle that leaves from The Inn and stops at the beaches across the property on a dedicated schedule. Spanish is the national language of Nicaragua; however, most staff members on property at Rancho Santana are fluent in English. Nicaragua observes Central Standard Time all year round, and does not observe Daylight Savings Time. Check-in is 3PM, and check-out is at 11AM. Early and late check-out is available upon request, and subject to availability. With the exception of service animals with proper documentation, pets are not permitted at Rancho Santana. Rancho Santana offers a wide variety of dining options on property, and our concierge team can recommend nearby local restaurants for those looking to explore the community. La Tienda, Rancho Santana’s grocery and dry goods market offers everything from drinks and snacks, to sunscreen and toiletries. Pre-arrival procurement services for those staying in Rancho Santana Vacation Rentals with kitchens are also available through La Tienda. Souvenirs and gifts can be purchased at the Beach & Surf Club at Playa Los Perros, the shop at The Spa in El Bosque, and at Galeria Rancho Santana, the property’s onsite art gallery. To enter Nicaragua, a valid passport is required. Visitors traveling from the US, Canada, and EU countries are not required to obtain a visa in advance. If you are traveling from another country not listed above, check with the embassy about visa requirements. A visitor visa (or “Tourist Card”) is required to be purchased for $10 USD per person when going through immigration at any border crossing or international airport. The local currency is Cordobas (NIO) The US Dollar and US credit cards are accepted almost everywhere in Nicaragua. Currency conversion rates can be found at XE Currency Converter. Rancho Santana uses a cashless system for goods and services purchased on property or arranged by our staff unless otherwise noted. Upon your arrival, you will open an account and everything, including off property excursions, can be charged back to your room. Rancho Santana accepts Visa, Mastercard, and American Express. If you find yourself needing cash, Concierge can provide up to $100 for a $5 fee. A 15% IVA (Nicaraguan Sales Tax) will be added to all charges at The Ranch, and a 10% gratuity is automatically included at our dining venues. For all other services, tipping is similar to the United States. Nicaragua uses the same electrical current and outlets as the United States (110 volt, 60mz). All accommodations are equipped with back-up power to run lights and basic appliances in the event of unplanned outages. Complimentary high-speed internet is available at all accommodations and clubhouses. Please note, the import and use of drones in Nicaragua is strictly prohibited. Professional equipment for commercial use may be subject to additional customs and import documentation and fees. Rancho Santana is a private, gated community. The facilities and amenities are for the sole use of property owners and resort guests. Rancho Santana underwrites the Roberto Clemente Health Clinic, located just outside of our main gate. The Clinic is fully equipped to handle any vacation-related injury or illness. If an issue requires additional attention, we can assist with transportation to a regional hospital in Managua. No vaccines or shots are required for travel to Nicaragua. Rancho Santana’s state of the art water purification system provides clean drinking water from our own fresh wells. Bottled water is also available at La Tienda and in all accommodations. Rancho Santana is a casual beach community. There is no dress code on property. We recommend packing sneakers, or other closed toed athletic shoes if you plan on participating in any of the activities and excursions. All accommodations are stocked with shampoo, conditioner, body wash, and a hair dryer. Complimentary laundry services is provided for linens and towels. Personal items can also be laundered for $5 per load.